With the Holidays approaching it is important to remember that many potential hazards face our furry friends. 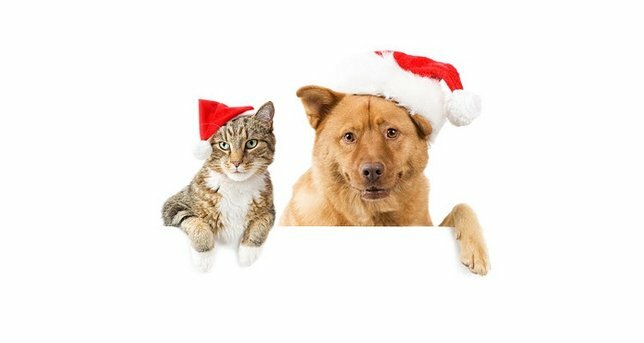 Suffolk County SPCA offers pet owners tips to help keep their pets safe during the holiday season. Suffolk County, NY - December 22, 2016 - With the Holidays approaching it is important to remember that many potential hazards face our furry friends. Follow some simple precautions to keep your pets safe. This time of the year can be very exciting yet at the same time very stressful not only for you, but for your pets as well. That is why the Suffolk County SPCA would like to offer pet owners the following tips to help keep their pets safe during the holiday season. Tinsel should be avoided because your pet may think that it is a toy to play with and they may accidentally swallow and choke on the tiny strings. In addition, do not decorate your tree with popcorn or other food items and remove all edible gifts from under the tree. Never hang edible treats, such as stockings filled with chocolate and other candies on the tree or fireplace where your pet can reach it. Chocolate can be toxic to their health. You should also try to hang small and breakable ornaments out of your pet's reach. Do not place chemicals in your tree's water. It may keep your tree fresh longer, but it can prove very harmful to your pets. Do not allow your pet to drink the tree's water because it can get dirty very quickly and many pine needles fall into the water dish. A tight-fitting tree skirt over the tree stand may help to prevent this. Always make sure your pet has plenty of fresh water in his/her own dish at all times. Holiday plants, such as poinsettias, amaryllis, mistletoe, and holly are very poisonous to your pets. If these plants are ingested, they may cause vomiting, diarrhea, or even more serious problems. If you purchase these items for your home, please make sure that they are out of your pet's reach. Before your family celebrations, make sure that your pets have a safe, quiet area where they can rest. It is best to keep your pet safely in a bedroom where they can escape from all the noise and festivities. If your pet enjoys having company come over, just make sure they do not become too overwhelmed. They need quiet time to rest and relax just like you do. After you have had your fill of holiday turkey, ham, chicken, and/or roast beef make sure you throw those bones away - do not give them to your pet! You might think that you are giving them a treat, but actually you may be threatening their health. Bones can splinter easily and cause damage to your pet's throat and intestines. Bones can also become lodged in your pet's throat, which may result in your pet not being able to breathe. Perhaps most importantly, please make sure that all of your pets have proper ID tags on at all times because if your pet were to become lost, you would have a much greater chance of finding them if they have identification. Your friends at the Suffolk County SPCA would like to wish everyone a warm and memorable holiday season. Subject: LongIsland.com - Your Name sent you Article details of "SCSPCA: Safety Tips to Keep Pet Safe During the Holidays"